Doctor in Medicine and Surgery from the University of Valencia. He specialized in Ophthalmology in Las Palmas de Gran Canaria, Mainz (Germany) and Limoges (France). Since 2001 he has been working in several private and public Hospitals. He is currently co-director and founder of Aiken in Valencia. He was nominated as delegate of the French Society of Ophthalmology in Spain. 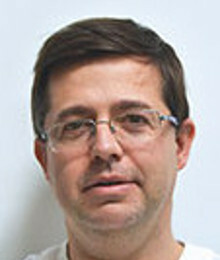 In the last years he was the Director of the Master of Ophthalmological Nursing and was a teacher of several courses of the American Academy of Ophthalmology (AAO) devoted to the treatment of keratoconus .He also is Medical Instructor and Academic Accreditation Representative of the European Society of Cataract and refraction (ESCRS) for the Keraring technique. His main areas of interest are related to the prevention of anterior segment eye diseases. He is an expert in cataract surgery, especially excimer laser refractive surgery, last generation surgery for presbyopia and keratoconus, intracorneal rings surgery and cross-linking.